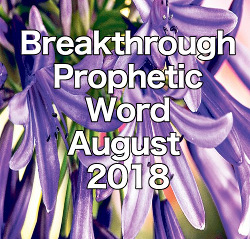 This is the breakthrough prophetic word for August 2018 from Prophets Russ and Kitty Walden. To request prophetic ministry over your life visit us at propheticnow.com. It is our honor the wash your feet in the prophetic. We want to be the prophets in your life! Transcription: “…The Father says today that this entire month is a month of preparation for big moves in the lives of My people in September. When you get ready for a move, there are arrangements to be made. Out with the old and in with the new. Decide now about what you are leaving behind and what you are taking with you into this new season says, God. Do not be a spiritual hoarder. There are understandings and teachings and histories from the past you have dragged with you for years that now must be left by the wayside. These things will only slow you down. Let go of that sentimental attachment to what I said five years ago that you might open your heart to receive what I am saying today. Let go of what made sense to you ten years ago and get yourself retrained for new wisdom, new understandings that will obliterate the limitations of the past and move you into a new place of promotion and forward momentum. I am preparing you in August to come out of the stuck place in September. September is your fast track time says the Father so get things streamlined in August or you will fall behind unnecessarily. I command you to identify the ballast and those things you have used to keep yourself under the radar. You are coming out. This is a coming out time for you and time for you to surface that you might launch the full barrage of spiritual weaponry at your disposal against the enemy who thinks he has you surrounded. The enemy is not in the ascendency in your situation. He believes he is moving in for the kill in your life, but I am merely bringing him danger close to destroy all his plans in a moment of time. You will see the well-laid plan of the enemy vaporize instantaneously before your eyes. The smoke will clear, and the only thing left will be the table that I had prepared for you in that place of enmity all along. The Father says get this in your spirit: ORDER BRINGS GLORY. August is a month that I am commanding you and commandeering you to come into relationship with My order that brings glory. Order brings glory says the Father so seek My order and set things in order in your life and your situation. No more flying by the seat of your pants depending on My clemency to take your imperfections and personality flaws into consideration. I am giving you the opportunity in the next few days to connect with the carriers of My glory for the carriers of My glory are the men and women of order that are coming forth into the earth. Their names are not well known, but their authority is unimpeachable. They will touch your life with signs, miracles and wonders and whole spiritual tribes will spring up around them even as those that gathered to David after Samuel poured the kingly anointing upon him. You are a mighty man, a mighty woman of the king and now is your time to form ranks and come together for conquest against all the work of the enemy in the lives of those around you. My order is coming, and My glory is coming with it. I include this day what men have excluded. I am eliminating what men have included. There are things that men have added of their own human thinking into what I am doing that is being rejected, and a new order is being established as a container for the glory that I am pouring out upon the earth. The walls that men have erected are being broken down, and I am rebuilding the walls, even the ancient landmarks that will cause My people to once again see signs, miracles, and wonders that haven’t been seen since biblical times. I am raising up says the Father. I am raising up. I am raising up men and women with hearts for order that will contain my glory and not attempt to control my glory. I am bringing liberty to my people that will produce my governance on the earth. It’s a new day and the only way you will be able to walk in this day is to be men and women who reject disorder and walk as obedient sons and obedient daughters. Because you have sought My face will see My hand moving in your lives and your homes. In your houses of worship and your cities. In your nation, I will move to lead captivity captive and restore your land and restore that nation who declares that I am their God and they will not bow to another. In that land, I will show Myself mighty to do and mighty to save from the calamities that are coming upon the goat nations that have turned their hearts from Me. Good day ministers of God. You are truly the servant of the most high God. God bless you, your family and ministry in Jesus Christ Name, Amen. Sow into this ministry that God uses daily to conform and direct my life. Thank you for the prophetic word and the time you took to write to me. I felt encourage God bless you both. Praise God! Looking forward in all God has. This was an awesome, powerful word. I thank the Father for your ministry. So blessed! Ready to receive all that you have designed for me and your people.